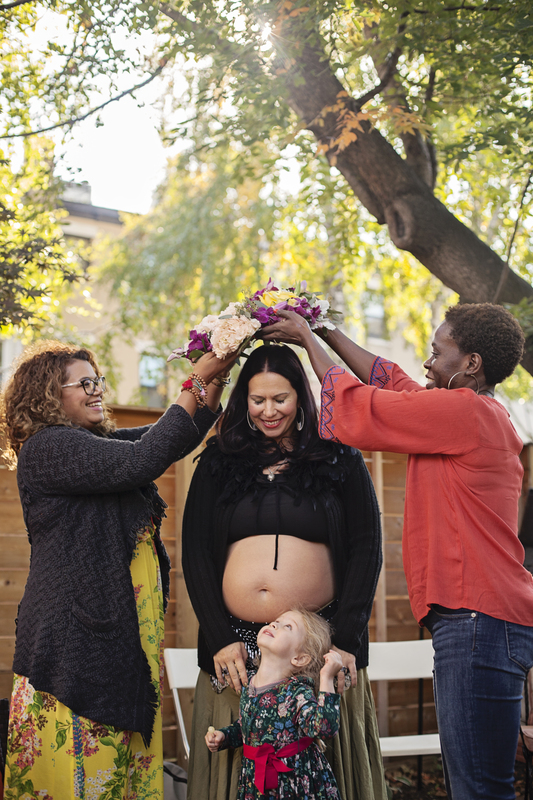 With this fourth pregnancy, I’ve focused on embracing the sacredness, beauty, and divinity within the preparation for the right of passage of birthing and of re-entering motherhood. Instead of skipping to thoughts of the end result (Zion, a healthy baby boy in my arms), I’ve allowed myself to sink deeply into the process and journey of carrying my child. 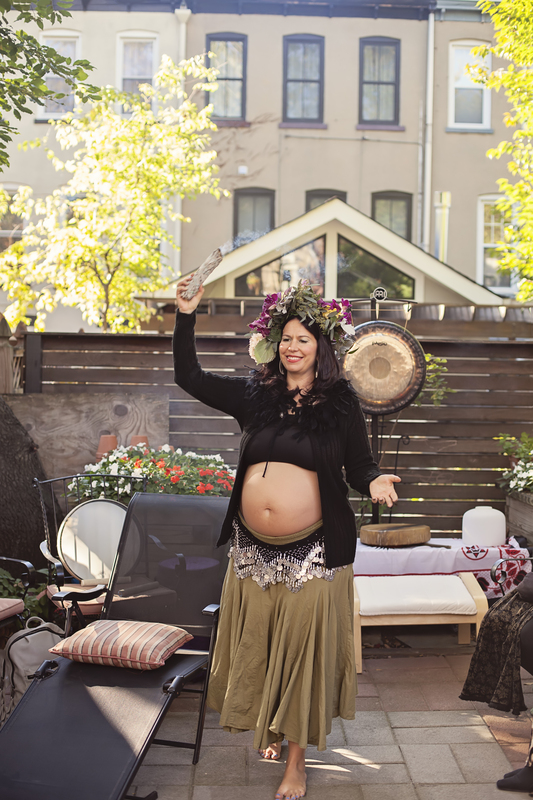 Alongside embodied integration of my spiritual practices, sadhanas, and inner feminine guidance, I dove into research of Sacred Pregnancy and Sacred Birth. In the book, Mother Rising by Donna Miller Watelet, Yana Courtlund, and Barb Lucke, I found a ritual called a Blessingway. 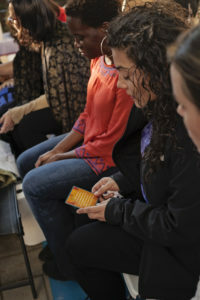 With ties linking back to Navajo tradition, this sacred ceremony is now re-emerging in women’s circles and sistership communities, adapted and modified to serve the uniqueness of individual women. 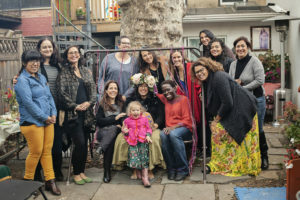 I searched for a circle or a facilitator that could host a Blessingway ceremony for me, but found nothing, even within the holistic health communities of my populated city. So I looked literally, to my own backyard. 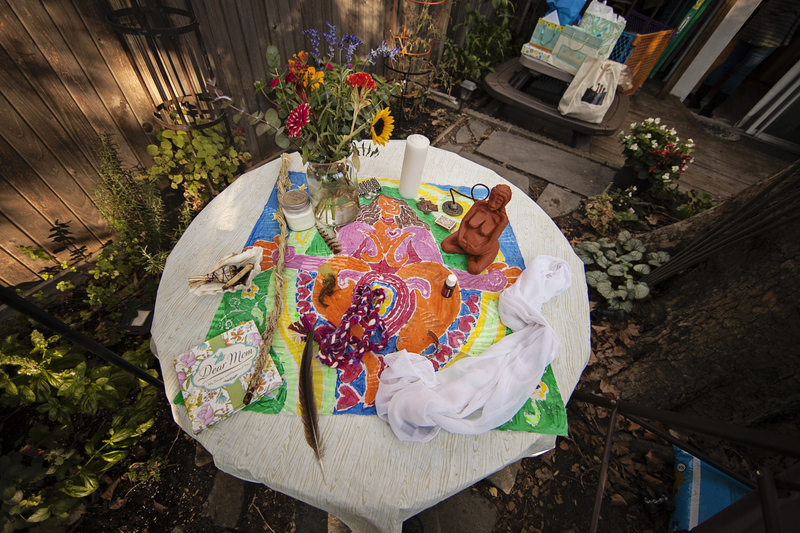 I turned to my Seasons of Womanhood’s sacred online sister circle to voice my desire for this ceremony and offered the outdoor garden space of my Seasonal Health Apothecary to hold the ceremony. 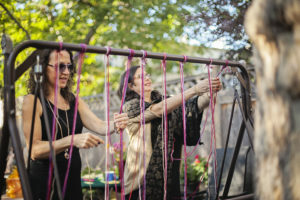 This turned out to be a perfect setting, a true oasis in the center of an urban area in Hoboken, with a 100-year-old, wise Birch tree standing right in the middle of the garden. In this space, I regularly hold women’s circles, sound meditations, moon ceremonies and healing sessions with patients. The low-lying, fall afternoon sun, graced us with its humble, warming presence, glittering through the leaves, moving with the change of season’s light wind, whispering with the spirit that weaves us all together. Surrounded by a rainbow of colors that beautifully framed our sisterhood, I stepped into the circle. Since many women were new to the experience of gathering in the circle, and all of us were new to this Blessingway ritual, I chose to open the circle and set the sacred container for all the beauty and adornment to follow. I called us together with a strike and echo of the gong and then circled around to smudge each woman with cleansing, white sage. Using the tools that selected their service, prior to our gathering, I first picked up a medicine moose skin drum, that I had crafted in a ceremony last fall. Moving throughout the circle, I struck a steady rhythm, symbolic of the sound of the human heartbeat, transporting us back to our time in the womb, when our mother’s heartbeat was our first, primal sound. 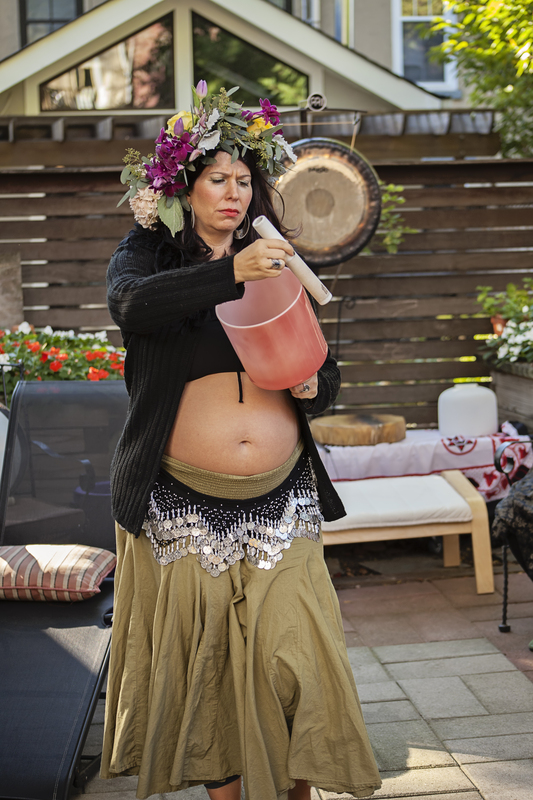 “We are made of water,” I said, “and the sound resonates within our bodies and connects us all.” Continuing in rhythm, amplifying the sound, I explained how the very act of drumming is reclamation for women. I then offered a sacred, angelic toning with a crystal bowl. 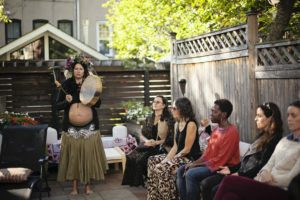 The women relaxed into the vibrating sound, as I connected with Source, singing as guided, connecting us with our roots, ancestors, our sacrum, and the earth. With a rose quartz crystal bowl, I offered another toning, connecting us with our higher heart, our truths, and our deepest desires. 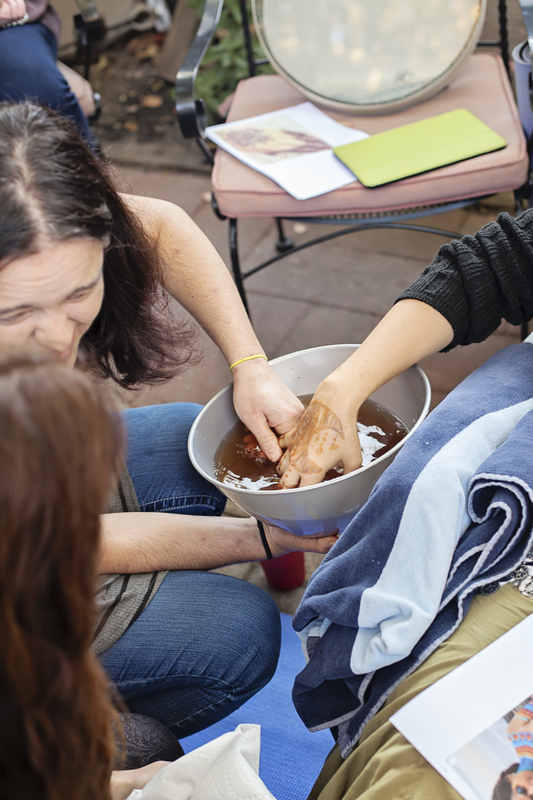 Love, compassion, and service resonated through our water filled, feminine bodies, as our vibrations rose up to meet those of the fiery, Aries full moon. The ocean drum concluded our opening ceremony, with silver beads that rock from side to side, creating the sound of crashing waves, inviting us to feel and visualize our favorite beaches, as the sun touched our faces. I now shifted into the role of receiver. My sisters brought the adornments and colorful preparations for the ritual, crowning me with a fresh and fragrant, floral coronet.The scents transported me a back to the harvest moon of last October, where I found myself in Maui, on the Wild Sacred Women retreat, rediscovering my sacred, wild self in a similar, flower crown making ritual that called me back to my beauty and power, after two years of deep, maternal sacrifice with my first daughter. 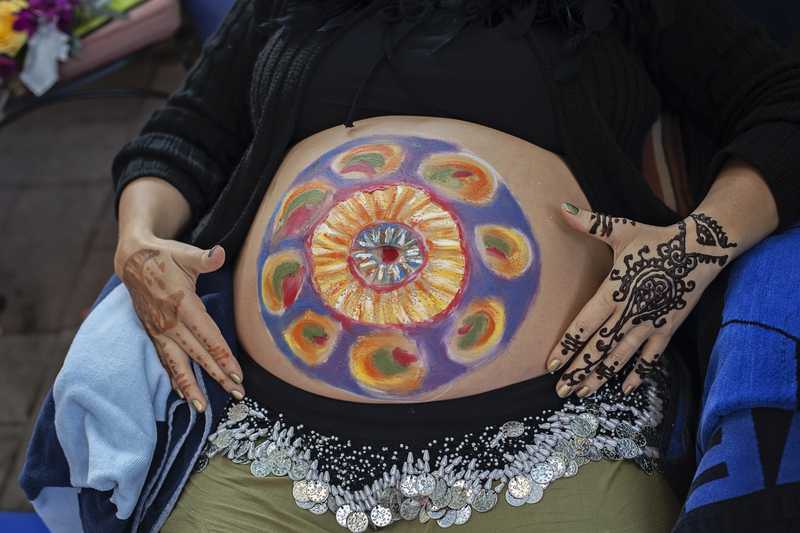 I relaxed onto a lawn chair recliner as my sisters took turns creating my belly mandala. 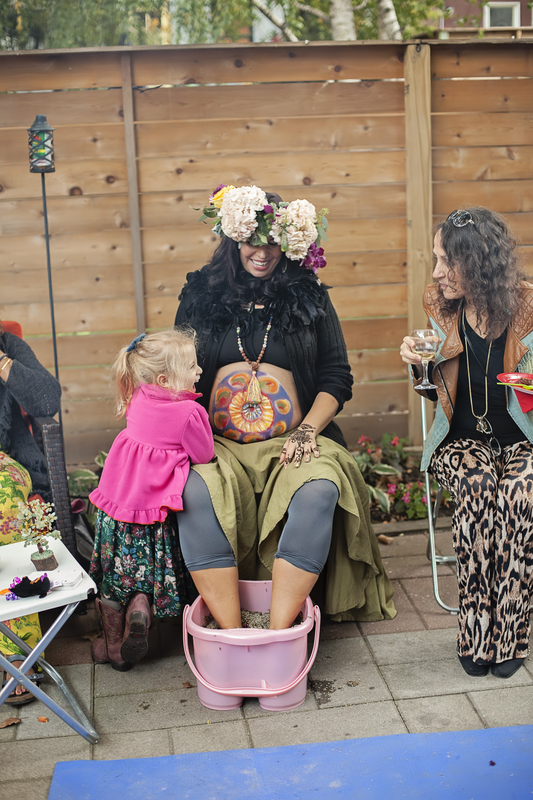 Using rainbow colored paints, stencils of the moon and goddess patterns, and rich, freshly made henna, brewed with my Seasons of Motherhood sacred pregnancy tea. 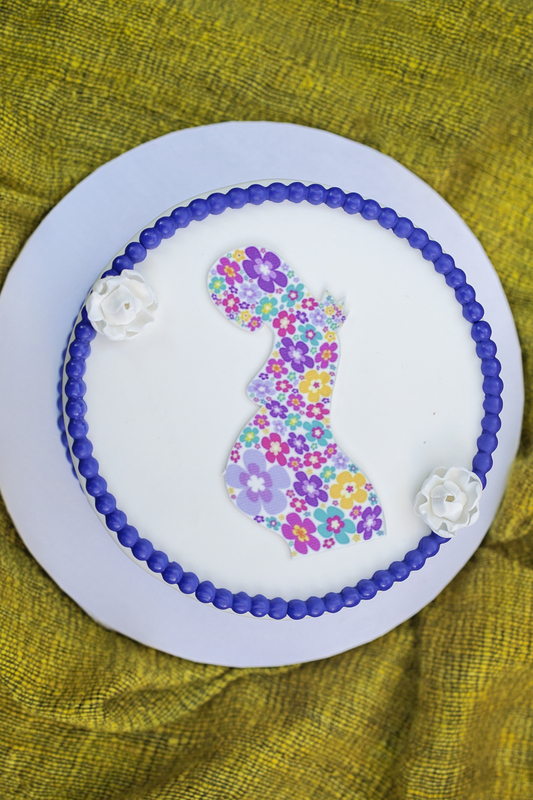 They lovingly adorned the full expression of my growing womb. 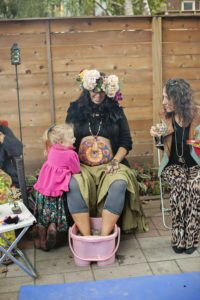 The cold paint met my warm womb with love and an array of color. I soaked in the earthiness of the wet henna, the scent of wet, fertile soil reminding me of the earthy smells of afternoon showers of the Africa of my childhood. My eyes drifted around this circle of women who served as my reflection. I saw their own eyes fill with gratitude and joy to share in this experience. 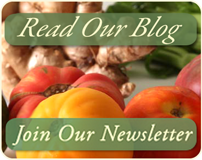 I recognized their appreciation of the nourishment they were also receiving in this ceremony. 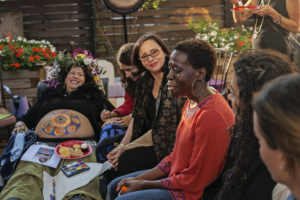 Each woman drew an affirmation card and read it aloud into the circle. We marveled at how the cards chose their reader and how the wisdom they offered nourished them as well as me. 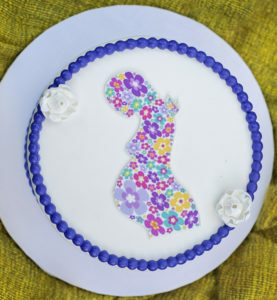 As my sisters continued their creative expressions on my belly, Rev. Venida Rodman Jenkins graced us with a gorgeous, gospel song. 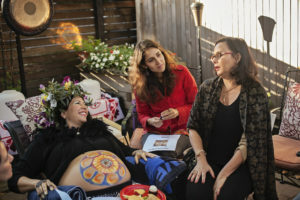 She then offered a universal prayer, blessing my strength in delivery and birthing, blessing Baby Zion as he nears his entrance into this world. These blessings were grounded at my feet, as Rev. Venida anointed them with holy water from a sacred site in Israel. Inspired by Rev. Venida’s song, my sister Andi offered up a classic Italian love song. Its beauty and sincerity brought us to tears. 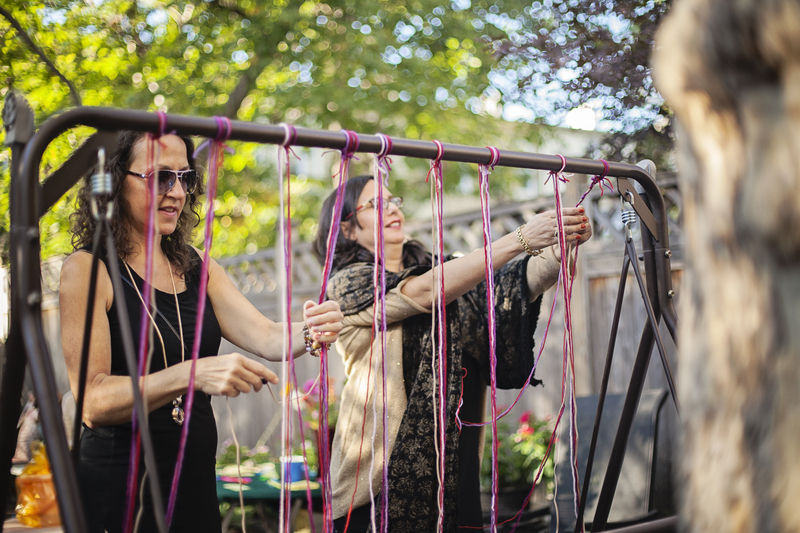 We shared in delicious and healthy homemade dishes, as my sisters collaborated to weave a symbolic umbilical cord, holding their love and intentions, contributing a blessing with each bead they strung. A symbol of love and nurturing between myself and Zion, myself and the divine mother and all of us in this motherhood collective. 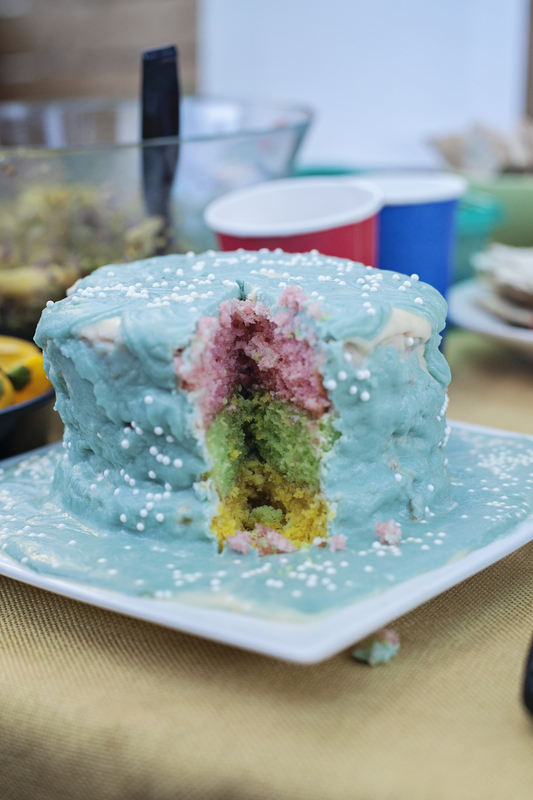 We celebrating by cutting the layered, rainbow cake, just before I was led to a seat to soak my feet in a homemade, lavender and rose footbath, prepared by my spirit sister Melinda. I lit a fire to enjoy the full moonrise in Aries, to soak up her fiery essence as fuel for my transition into motherhood. The circle supported me in the coming of this immense transition. I sipped South African rooibos tea to remind me of my roots and give me an added boost of support. The energy of this experience ripples inside me, and I felt Braxton Hicks contractions for the first time, this pregnancy. As my sisters began cleaning up around me, exiting one by one, to make their way back into their daily lives, I remained alone with my inner reflections, spirit, and Zion’s soul ever so present. I kept soaking my feet, sitting in front of the fire, beneath the full moon, reflecting on all this beauty, this sisterhood, and the magical alchemy that takes place as a woman transcends the right of passage that birthing and motherhood offer. Touched by awe and deep remembrance, she is never the same again.